How can I learn more about the pews or chairs? Please understand that Gabriel Ministry Services does not own or possess the pews, chairs or furniture. They belong to the churches that want to sell them. We are putting buyer and seller together. In some cases, the church selling the furniture may have asked us to respond (via email) to inquiries for them, which we will do. What about the condition of the pews? Generally they are in pretty good condition. However, please remember that they are used. They will have scratches, bad places, etc. But, in 98% of the cases they are useable as you see them. Ask us about them, and we will tell you. We are not trying to hide anything. Occasionally they may need some work, but they are easy to work on. Email us if you need ideas on refinishing or touching up your pews. I have pews, chairs or pulpits to sell... how do I list them? Just simply click the “Post an Ad” Button at the top of the page, and it will walk you through the process. There is a video on the landing page, explaining it all! We do not offer delivery services for the pews. However, we know of several folks who do move, modify, deliver and install pews. See our delivery page. What guarantee do we get? We do not offer one, and the selling church probably won’t either. If you are interested in guarantee, we recommend New Church Furniture. Payment can be made directly to the selling church, or you can use a legitimate escrow service like www.escrow.com. (This is the service EBay recommends). The first deposit will hold the pews for you. The key word is first. When we list these for sale, they usually don’t last long. We have sold some within 1 hour of listing them. Is this a safe way to do business? In a word, yes. Our service has assisted churches for many years and we have a physical office, real people, etc. We really answer the phone, too (if you call during business hours) 888-993-3539. Take a look at our testimony page. Keep in mind that this is a church to church transaction. It is as safe as anything we know about. Just make sure you are only doing business with USA or Canadian churches, missions, ministries or synagogues. 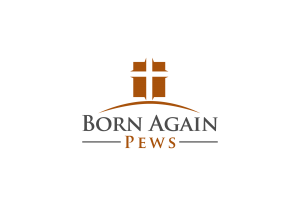 Born Again Pews is in the service of Helping Churches Grow! It is our desire to help new, small, and start up churches find the equipment (furniture) that they need to have worship services in style and comfort. We work to that end by providing a venue for churches which have furniture to sell or give away, so that churches in need can find it easily. All the funds from the sale of the used furniture goes directly to the church selling it. In other words, there is no profit to us in the buying or selling of the furniture. How can pews be made shorter (cut down)? They can be easily cut down. Here is how…. Take the molding off around the end (be careful not to break it) and underneath there will be screws. Look under the end for screws also. Remove the screws and pull the end off (might be tight). Next, (depending on how much you are cutting back) peel back the fabric and foam. You can cut the foam with a knife or scissors as needed.. Leave enough fabric to wrap back around the end. Then, with a Skil type (circular) or reciprocating saw, cut right down the back (watch for screws/nails) and then cut the seat. Some pews may vary in design, but you can usually cut straight down and then cut the seat, then rewrap the fabric around the end, then put the end back on. Any carpenter should be able to do it. Most people charge about $50-100 to cut one down. We also have some people available to help here. If you want the bookracks and supports to be evenly spaced, you may wish to cut down from both ends. What if we need another color fabric? Many companies specialize in pew cushions, pew upholstery and re-upholstery services. Visit New Church Furniture for assistance. It is a fair question, but really there is no catch. We are here to help you and your church, and other churches across the nation. We gets lots of positive feedback and it is a blessing for us to be able to help. If you want us to help you, we are glad to. But to continue to exist we have to pay our bills, so we ask for your help with a donation. As a ministry service, we do not “charge” you anything. We do not have any “selling fees” like the auction sites. But, just like your ministry, if we did not have financial help we would have to shut down. So we now ask for a donation (whatever God lays on your heart). In the past, we just suggested that churches mail us a donation after the pews sold. Well, about 45% failed to send in anything, and it almost put us under. So now we have to ask for the donation at the time of listing. There is no big payroll here, only part-time and volunteer help. Our main expense is the advertising (each time you find us on the search engines they send us a bill), magazine ads and internet. Our Advisory Board suggests 3-5% of the listing price, but it is up to you. Some give more, some less. But if you are looking for something for nothing, you will get nothing in return. We believe this is scriptural. “The laborer is worthy of his hire”. “Give, and it shall be given unto you”. If you are without resources, we will still be glad to help you anyway. Just let us know. Just a note here, since we are providing you with a service, this donation is not tax advantaged. However, since churches do not pay income tax anyway, this will have no effect on your church, synagogue or ministry. Who will buy my pews? There is a new church, ministry or temple starting somewhere each week. In addition, many smaller ministries, youth ministries, urban ministries, etc are needing seating at a value price. The need is tremendous, and ongoing. We get, on average, 500 visits daily from people looking for used furniture. That is about 15,000 inquiries each month. We will soon have recorded one half million visitors! We are working to increase that with our advertising schedule. Over the years we have provided this service, every set has eventually sold, with the exception of those which are given away freely. The church, temple, chapel, group, etc that is buying your pews and chairs will be responsible to come and get them. We suggest that you offer to assist with loading. We have found the best method is to rent a a truck from U-Haul or Ryder. Think about it for a minute. You can send a guy in an airplane anywhere in the US for $250 or less, rent a truck and drive it home loaded with furniture. You can try Craters & Freighters (they move stuff), also. A new service offered is called PODS – Portable on Demand Storage. They bring a container, you load, they move it or store it for you. How do they get moved? Who is looking at my pews? Pricing your Used Furniture & Receiving Payments. How much should I sell my pews, pulpits, or chairs for? The rule of thumb is that used furniture should sell for about 25% of the cost of new. A new padded pew generally sells for about $50-60 per foot, an all wood pew about $70-80 per foot. Generally you will find that pews move the most quickly at $150-200 each. You should price them per pew, since a small church or ministry may not need all your pews, and it always sounds better to say $150 each instead of $5000 for all. Note: we recommend making all your pews the same price per pew. If you have a few longer pews (for example in the choir) and make them more expensive, they may not sell. Not everyone uses choir pews. Keeping the price the same on all makes it easier to sell them. Used chairs of the “church chair” type generally sell for $20-25 each, depending on the condition and color. If they are burnt orange color, better go with $15. If they are a pretty red, blue or green, and in clean condition, you can probably get $25 each. Used pulpit sets, (pulpit, table, chairs, etc) usually sell for $750-1000 for the set. Used Minister / Deacon type chairs go for $ 100 – 200 each. Based on our experience, it averages about 4-6 weeks to sell your furniture. Some sets sell in 1 day, some take 6 weeks or longer. It depends allot on the sizes, condition, and price. While we want you to be truthful, don’t over emphasize all the bad things about your pews. They may not bother someone else unless you point them out. Mention only structural problems that need correction or repair. Normally a church to church transaction, between churches in the USA or Canada, is safe. You can request a church check, certified check, Paypal, cash, etc. You may opt to use an escrow service to help facilitate the funds. The only one we can suggest isEscrow.com – which is a legitimate service that is recommended by eBay, BankRate,Epinions and other well known firms. In the years we have offered this ministry service (since 1998) we only know of 1 church that got scammed for money. Thousands have been helped. Our purpose is to Help Churches Grow by providing a service to find reliable used church furnishings and equipment at low cost or free. Since 1999 we have helped to furnish thousands of churches across the country. Who can sell pews here? Anyone! We are here to help anyone in need of pews, or anyone who needs to get rid of them! How do I send photos by email? To send photos, there are many different methods. Click the browse button to find photos on your computer, then submit them to us. Place the mouse curser over the photo. Click once with the right mouse button. An email window will open. Put a note that it is from your church. Do this for each photo you wish to send. Then go down the aisle about 4-5 rows, turn around and get the back angle, also showing the end, and bookracks if any.